Between 30 of October and 7 November 2018 trainers of the Hijman Degen Foundation/Art Therapy International provided an introductory and an advanced training in Erbil and Duhok, Kurdish Iraq for SEED foundation and EMMA organization. The trainings where attended by 34 trainees in total and where highly appreciated. Almost all of the trainees are working with survivors of war. Future training for the SEED Foundation is in preparation. Two trainers of the Foundation trained participants of the Kirkuk Center for Torture Victims in Sulaymaniyah in June 2013. In addition to the manual, the Foundation also provided the creative materials. In September 2012 a trainer of the Foundation taught an introductory course to six employees of IBISS, a Brazilian NGO. They work in the slums of Rio de Janeiro, where drugs-related violence is an everyday occurrence. In Cameroon, 4 training courses were taught in cooperation with the Centre for Rehabilitation and Abolition of Trauma (CRAT), a local NGO. A 2-week training course in September 2010 for CRAT aid workers by two HDF trainers. During these two weeks, close consultation with the local authorities preceded the planned training for primary school teachers. Training from 4 – 8 April 2011 by two HDF trainers to 12 CRAT employees. 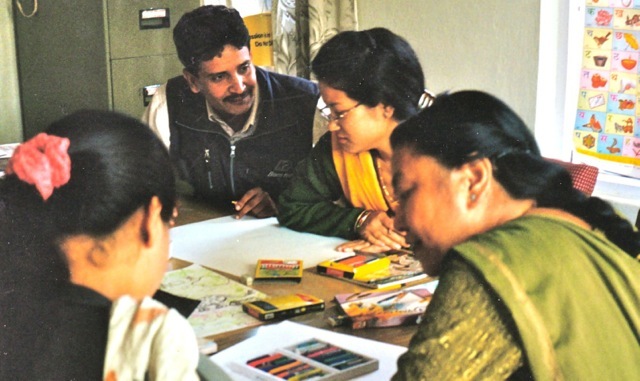 Training from 11 – 15 April 2011 by two HDF trainers and five CRAT supervisors to 26 primary school teachers. These teachers worked at 9 public schools in areas where much tribal tension had led to bloodshed in recent years. Training from 8 – 12 August 2011 by three HDF trainers to 27 primary school teachers from 15 public schools. Impulsis contributed half the training costs. In June 2009, 15 trainees from Iraq and a few trainees from Lebanon took a 5-day training course. Due to the unsafe situation in Iraq, this course took place in Beirut, Lebanon. The course was taught by one HDF trainer and was organised by the International Rehabilitation Council for Torture Victims (IRCT). EC/UNOPS bore the costs. Twice, we organised a 5-day training course (basis and follow-up) in cooperation with the NGO Kamerno Pozoriste Muzike Ogledalo (KPMO). The 21 participants included psychologists, a pediatrician and theatre makers. The training took place in rather primitive conditions in a dilapidated neighbourhood centre in Novi Sad. The participants were keen to learn and positive. The course was sponsored by Oxfam/Novib and the Hijman Degen Foundation. In collaboration with the War Trauma Foundation, 25 aid workers were trained during one week in Algeria by two of the Foundation’s trainers. Due to the political situation, the scheduled follow-up training had to be cancelled. The Foundation donated visual materials and training manuals. From 6 – 9 October 2007 the International Rehabilitation Council for Torture Victims (IRCT) held its ‘Regional Asia Seminar’ in Siem Reap. Trainer Fiety Meijer provided an introduction on trauma art therapy to 60 aid workers from 10 Asian countries. A training course took place from 15 – 20 October 2007 in Phnom Penh for TPO Cambodia. There were 24 participants: social workers, psychologists, psychiatric nurses and doctors. The Foundation provided training manuals and visual materials for both courses. Both courses got very positive responses.